• Data on practice characteristics were obtained as part of a national questionnaire study of surgeons in the United States. These included location and organization of surgeons' practices, use of nonphysician personnel, provision of ambulatory care, other professional activities, and variables associated with work load volume. A multivariate analysis was done to examine the relation between operative work loads and various practice characteristics. 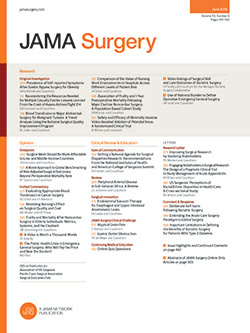 The variables associated with larger operative work loads were group or partnership practice, principal office not in a hospital, more nonphysician assistants in direct contact with patients, more hospitals in which operations were regularly done, and smaller proportions of nonsurgical patients. Group or partnership practice and nonsurgical practice were found to be most strongly related to operative work load.